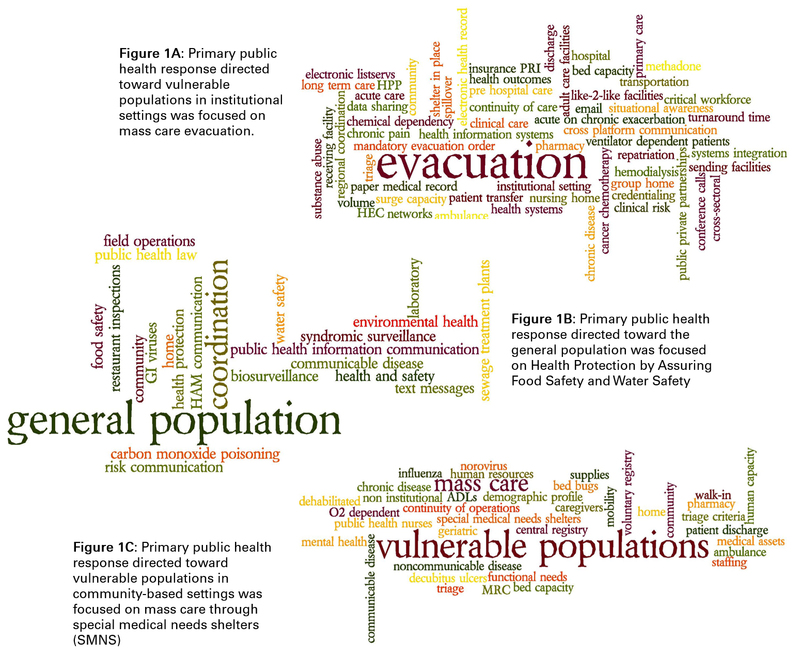 A systems analysis approach was used to evaluate to public health response based on triangulation of (1) one-on-one interviews with multi-sectoral key informants (n=21) and subject matter experts (n=8), (2) focus group discussions (n=2) and invited meetings (n=8), and (3) process evaluation of stakeholder meetings. We have also used content analysis of situation reports, annual reports, and after action reports to validate the qualitative findings. Findings obtained thus far indicate that there were several surge capacity challenges during Hurricane Sandy involving the transfer of patients to and from hospitals, nursing homes and special needs shelters. In many instances, the public health agencies received requests to carry out tasks that were beyond their purview, often resulting in improvised decision making processes that have not been analyzed extensively in previous research studies. During the second year of this project, the investigators are also carrying out disaster response trainings in relation to identified gaps. Within a comprehensive health system, both the public health and healthcare delivery sectors are called upon to preserve and protect health. Though these activities might be regularly siloed, if there is a lack of integration, the burden (patient transfer/flow) falls disproportionately on one sector during an acute disaster. A lack of integrated planning between public health and healthcare delivery sectors can lead to new and disproportionately distributed burdens during the response. Further, these burdens may persist into both the short and long-term recovery phases and trigger fundamental changes to the delivery of primary care within the community/public health context. Findings obtained thus far indicate that in addition to prioritizing the health protection of the general public, both counties also directed attention and resources to elderly patients residing in various home- based vs. community-based settings, such as long-term care facilities. Particularly for this cohort of vulnerable patients, coordination between the public health and healthcare delivery sectors was important in patient transfers to institutional stakeholders across the health system: hospitals, nursing homes, and special needs shelters. 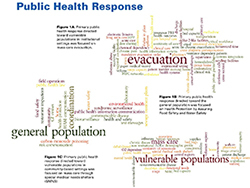 Many areas of public health participation are highlighted under Emergency Support Function #8 federal guidance , however, the public health sector does not always lead the response for each area. Lack of participation should not be dismissed as a performance failure as participation can occur in many ways.